Deveneys of Dundrum: August white beer synopsis. Each of these tasted last Thursday were nicer than the previous. For the first time we all had difficulty deciding on the top 3 - let alone the favourite. The Theme for the August tasting was white beers. I tried to diversify the line up so we did 2 Belgian, 2 German, 1 American and a Lithuanian. Although Belgian wheatbeers would be considered the benchmark white beer, the others made for very interesting comparisons. The first of the night was Wittekerke authentic Belgian wheat beer. This pours a yellow creamy colour and drinks like a glass of milk. On the palate its light in flavours, flowery with a slight hoppy and citrus finish and a creamy mouthfeel. It doesn't feel anywhere near 5%alc. I loved this until we tried St Bernardus Wit. This was by far my favourite beer of the night. Summery, fruity really crisp palate and a refreshing zesty finish. The palate was orange, honey and herbal notes. Felt heavy on the palate but the wheat didn't form a pizza base in the pit of your stomach. Really summery and easy drinking. Brewed with the help of Pierre Celis - the guy who put Hoegaarden back on the map. Not massively into the picture of St. Bernardus on the bottle - he's a little strange looking. The beer is really really good though. Flying dog - inheat wheat, 4.7%. Hefe ale that hails from the United States. I was really pleasantly surprised by this American take on a German wheat beer. I'm a huge fan of American micro-brewery stuff but probably because they're a little lighter in style than there counterparts and an easier more approachable style. This definitely didn't have that heavy doughy mouthfeel but the nose and palate were distinctly banana, slightly floral -heather maybe and a creamy slightly citrus finish. Very good, very very good. We moved into Lithuania and Svyturys Baltas, 5%. non filtered wheat beer. Banana and clove on the nose, fresh and zesty with a delicious creamy palate. Flavours of orange, clove, banana and a slightly spicy - black pepper finish. I think you know what I'm gonna say - really good, really really good!!. Weihenstephaner dunkel/hefe 5.3%. From the oldest brewery in the world and awarded the best dark beer at the World Beer Awards. A totally different palate than the previous few. A more wintery style of beer- rich and dark whilst still retaining the qualities of an authentic German wheat beer. Banana, clove, spice, caramel with a juicy heavy fruit finish. A beer designed both to accompany food but pretty amazing in a cold tulip glass watching t.v. 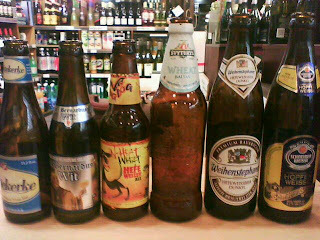 The last German wheat beer of the night was a little unusual and got a mixed reaction. Personally for novelty and innovation alone, I rated it pretty highly and love the concept. This is a collaboration between Brooklyn Brewery and Schneider. Combining the traditional style of a German Wheat beer with an American twist. Schneider/ Brooklyner Hopfen Weisse. At 8.2% this is huge wheat beer which is heavily hopped. The palate has banana and spice with some floral hop characteristics and high residual sugar but a very balanced acidity on the finish. I think because it's such a strange blend initially this tends to be a little difficult to get your head around/ palate around. This is the 2nd attempt at this brew and I like the idea of 2 friends with 2 different brewing techniques from 2 great breweries combining their own styles and creating this together - a beer baby!!! Overall this was a brilliant tasting -possibly the best yet. Keep you all posted on the new gear arriving this week. Labels: August white beer synopsis.